Published: Dec 9, 2013 to ? Katagiri Yuuichi believes that friends are more important than money, but he also knows the hardships of not having enough funds. He works hard to save up in order to go on the high school trip, because he has promised his four best friends that they will all go together. However, after the class' money is all collected, it's stolen! Suspicion falls on two of Yuuichi's friends, Sawaragi Shiho and Shibe Makoto. Soon afterwards, the five of them are kidnapped, and wake up in a strange room with a character from a short-lived anime. Apparently, one of them has entered them into a "friendship game" in order to take care of their massive debt. But who was it, and why did they have such a debt? Could they have stolen the money from class to pay for entry into the game? Yuuichi and his best friends will have to succeed in psychological games that will test or destroy their faith in one another. Tomodachi Game has been published in Spanish as Tomodachi Game: Los Juegos de la Amistad by Milky Way Ediciones since March 2016. Why did i give it 9 and not 10? well here is my reason, The story is actually very interesting about how a group of friend suddenly wake up in a room and told by the game master that one of them have a huge debt but the game master say that if they play the "Tomodachi game (friend game)" the debt will be gone. Well technically it like testing their friendship and of course they agree and play the game. Yeah,the prologue of this manga is actually really plain if i have to said so. But what surprised me is the plot twist and to be honest i love it that why i gave the rating of story 9. But you know what? i hate this story in a way too, how the tactic/winning strategies was explained and you guess what? it's so damn long! and i don't really like long conversation or something like that, that's why i didn't give a 10 for the story. This manga is just so interesting and so unique and.. ugh i don't have the right word but who cares?! The only thing i know is I REALLY ENJOY THIS MANGA. but you know why i didn't give this a 10? that because there a little thing that ruined my enjoyment. like how the female character getting all clingy and stuff but well its okay i guess. other than that, i really enjoy this manga Thoroughly. i'm sorry if there any word that misspelling or wrong or something like that because i'm not that familiar with English language. Tomodachi Game as the title implies is a "Friend Game", a story about friendships, struggle, will and worth all wrapped up in a big mystery. Tomodachi game isn't anything super unique in its concept. It follows a group of friends as they go through a series of games carried out by a powerful, and secret organization. Each one of them harbors an insurmountable debt and they use whatever means to get that lowered or erased. This manga shines with its games. Every game is unique and well thought out, with a simple but made complicated formula. Their task is to complete each game and move onto the next. Their only advice is "Don't doubt your friends". There's a lot of mental anguish in this series and battle of the minds, similar to the popular series Death Note and Liar Game. The art is an eye opener for this one. It's dark and gritty when it needs to be and the facial expressions are unforgettable. It's engaging art where everything that's on the panel enhances all the other elements of that panel. It's nothing short of very good art. Characters in Tomodachi game stretch from your normal simple headed blob characters, to some rather interesting multilayered ones. Let me be straight, the side characters of this manga are weak, I rarely find myself caring for any of them. However, it makes up for that with our strong MC and character development. Now this being the Tomodachi game, all our characters are forced to overcome some struggle, thankfully this helps our MC show his more sinister side, along with learning more about himself and his friends. The other noteworthy character besides the MC is ... well you'll have to read for yourself to find out. Each of the characters appear boring but all have a little secret to them. This was a really fun read, watching all the little ways the characters struggle to find a way to beat each game is very intriguing and when they finally win, a huge surge of happiness rushes to me. Another big enjoyment factor was the mystery, who is in control of these games? What do we really know about these characters, all these factors keep me on my toes and it's something I always look forward too. Tomodachi game is a great read if you want the satisfaction of a great mind game as well as being able to really want to know about these characters. So should you read Tomodachi Game? Well, I sure think so, but if you find yourself thinking that the concepts of friends conquering all a little too cheesy for your tastes then you should probably stay away. Art : 8 : The art here needs no essay. The Drawings are great, and somehow relate to there characters. After reading 2 Volumes, you too will realize this. Satou, Yuuki may not be someone famous, the art is really outstanding. The theme is very dark and creepy. Character : 9 : Character development is not the greatest, but little by little is given every so often. The Personality of all characters are great, you could relate to them but i found it was difficult for me. Each of them live a very different life. One is poor and one is rich. 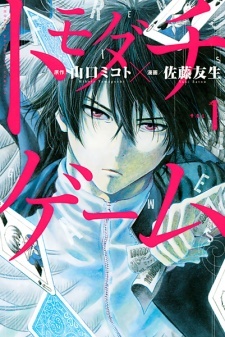 Overall : // 8 \\ : I really enjoyed the Manga, specially when i don't really get interested in those genre. I only read manga of those anime i truly enjoyed. This is a one of a kind anime which will make you question your friends in real life.